A person may be ineligible for a green card (i.e., inadmissible) due to membership in “the Communist or any other totalitarian party.” INA § 212(a)(3)(D)(i). See INA § 101(a)(37) (defining “totalitarian party”). That includes organizations “affiliate[d]” with such a Party. INA § 212(a)(3)(D)(i). In China, such organizations include minor political parties and mass organizations (e.g., Communist Youth League, All-China Federation of Industry and Commerce, All-China Federation of Trade Unions, All-China Women’s Federation). Such organizations are led by the Party, which uses them to penetrate the society at large and encourage popular support for Party policies. Robert L. Worden, et al, China: A Country Study (GPO 1987), http://countrystudies.us/china/107.htm. Further, a non-member may be inadmissible if he or she has been “affiliated with” the Party or one of these other organizations. Id. The term “affiliated with” is defined to include, among other things, “giving … money or any other thing of value” to such an organization. INA § 101(e)(2). But there are three important exceptions to ineligibility. First, a person is admissible if the membership or affiliation terminated at least five years before the date of application. INA § 212(a)(3)(D)(iii) (or 2 years in the case of a country where the Communist Party doesn’t control the government). Notably, inactivity can lead to termination of membership. A Party member who fails to take part in regular Party activities, pay membership dues or do work assigned by the Party for six successive months without good reason may be regarded as having given up membership. CCP Const., art. 9. Second, a person is admissible if membership or affiliation is involuntary, including “for purposes of obtaining employment, food rations, or other essentials of living and whether necessary for such purposes.” INA § 212(a)(3)(D)(ii). In China, it may be difficult to prove that CCP membership is “necessary” to obtain the essentials of life because alternatives to CCP membership are clearly better today than they were in the 1970s. In particular, private entrepreneurship has become an increasingly viable alternative to party membership. In China, many non-CCP members succeed in business, have security of person, benefit from the country’s economic growth, and so on. 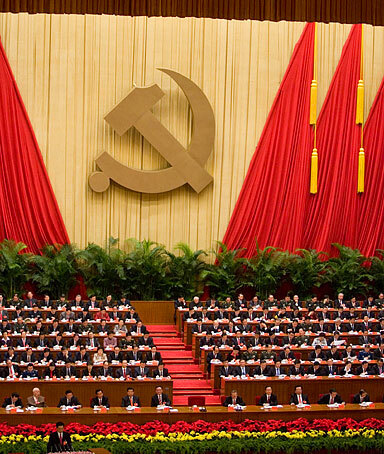 Today, CCP membership isn’t necessarily ideologically meaningful. Harvard Professor MacFarquhar quipped that the CCP is “a sort of Rotary Club of 70 million people who joined in because it’s good for their careers.” See David L. Shambaugh, China’s Communist Party: Atrophy and Adaptation 25 (2008). The Party is a mutually advantageous social network that distributes favors and privileges (guanxi) to its members. Mere membership in the party also signals elite status to potential government or private employers. It’s “shorthand for being an excellent person.” See Jamil Anderlini, et al., Welcome to the Party!, FT Magazine (Sept. 28, 2012). Membership is also a hedge against political risk, not unlike emigration. So it’s not uncommon for a person to write up a party membership application with one hand and fill in a U.S. immigration application with the other. Finally, in addition to these exceptions to ineligibility, there is also a waiver available in the case of the parent, spouse, son, daughter, brother, or sister of a U.S. citizen; or the spouse, son, or daughter of a lawful permanent resident. The applicant must be seeking admission for humanitarian purposes, to assure family unity, or for other reasons serving the public interest. The applicant must not be a threat to U.S. security and must merit a positive discretionary finding. INA § 212(a)(3)(D)(iv). Procedurally speaking, the government asks about communist party membership in the immigrant visa application form (DS-260) and the adjustment application form (I-485). The applicant and counsel should be prepared for related questions during the interview and should document eligibility for a waiver or the applicability of an exception to the ground of inadmissibility. A legal brief may be helpful. Immigrant visa applicants also need to be prepared for possible delays while the consular officer seeks a security advisory opinion from the Department of State in Washington, DC. 9 FAM 40.34 N3.3-1, N4.3, N4.4. To apply for naturalization, an applicant must prove he or she is loyal to the principles of the U.S. Constitution and the basic form of government of the United States. INA § 316(a); 8 C.F.R. § 316.11(a). writes, publishes, or circulates printed matter advocating the doctrine of world communism of the establishment of a totalitarian dictatorship in the United States. There are exceptions for persons whose membership terminated more than 10 years before applying for naturalization and for involuntary membership or affiliation. INA § 313(c), (d). There is also an exception for non-meaningful membership or association. INS Interpretations 313.2(c). The author, Gary Chodorow, represents businesses, investors, families, and others in U.S. and China visa, permanent residence, and nationality matters. He also writes the U.S. & China Visa Law Blog, at LawAndBorder.com.